Home » Directories » Buyer's Guide » Skyworks Solutions Inc.
Headquartered in Woburn, Massachusetts, Skyworks is a global company with engineering, marketing, operations, sales, and service facilities located throughout Asia, Europe and North America. For more information, please visit Skyworks’ website at: www.skyworksinc.com. Skyworks is pleased to present the SKY66110-11 and SKY66111-11, our new Bluetooth&reg; low energy front-end module (FEM) products for Internet of Things (IoT) applications. Skyworks is pleased to announce the launch of "How Wireless Works" - a short, animated video explaining what happens each time we use our smartphones, tablets or other wireless device. Wireless connectivity is everywhere and an integral part of our daily lives. Yet very few understand how it all works. This non-technical video is fun, informative and created for those who want to simply understand what enables all those seamless connections. Claiming the industry’s first fully integrated front-end solution for mass tier 5G cellular applications, Skyworks Solutions has introduced Sky5™ LiTE for mass market 5G handsets. Skyworks Solutions Inc. and Intel Corp. announced they are creating leading-edge 5G communications engines for a broad array of end markets. Skyworks Solutions Inc. launched its most advanced 5G cellular architecture yet, the Sky5™ Ultra. Skyworks Solutions Inc. announced that MediaTek is utilizing its Sky5™ suite for their new 5G reference platforms. Skyworks Solutions Inc. announced that its wireless engines are delivering connectivity in Sonos’ new versatile digital amplifier, the Amp. Skyworks Solutions Inc. introduced its suite of next-generation SkyOne® Ultra 3.0 devices specifically designed for advanced automotive applications. Skyworks Solutions Inc. announced that its advanced wireless engines are enabling Philips’ CityTouch end-to-end street lighting management platforms. Skyworks is pleased to announce the release of SKY68020-11, an LTE-M/NB-IoT front-end solution for low power, low data rate IoT applications. Skyworks is pleased to introduce our newest family of compact, high performance RF front-end solutions specifically designed for LPWAN and high-power Industrial, Scientific, Medical (ISM) applications including the connected home, M2M, tracking and other emerging IoT platforms. Skyworks Solutions Inc. announced that its high-reliability optocouplers are providing vital connectivity functionality in implantable cardiac defibrillators from a leading medical device provider. Skyworks Solutions announced that Nest, a division of Google (Alphabet), is using several of its wireless connectivity products in their recently launched video doorbells. Skyworks Solutions is now a member of ETSI, the European Telecommunications Standards Institute. Skyworks Solutions Inc. announced that its new portfolio of 802.11ax wireless connectivity solutions are being leveraged by Broadcom in their recently launched Max WiFi reference platforms. Skyworks Solutions Inc. announced that its broad product portfolio is rapidly being adopted by the world’s leading connected home and mesh network providers. Skyworks Solutions introduced the first product in a new family of highly integrated wireless networking solutions for mobile and IoT ecosystems. The SKY85812-11 is a dual-band front-end module incorporating a 5 GHz bypass LNA with SPDT T/R switch and a 2.4 GHz bypass LNA with SP3T switch, with a Bluetooth port for Wi-Fi antenna sharing. The SKY85812-11 also includes a 2 GHz LTE coexistence filter and diplexer. Skyworks Solutions, Inc. announced that ZTE is incorporating various products from its portfolio to power several of their all-in-one platforms for the connected car. Skyworks Solutions, Inc. released a new white paper, “5G in Perspective–A Pragmatic Guide to What’s Next,” providing the company’s insights into the quickly evolving fifth generation (5G) global telecommunications standard. Skyworks Solutions, Inc. released its 2016 Sustainability Report, a voluntary public document that provides a comprehensive self-assessment of the company’s commitment to sustainable business practices. Skyworks Solutions, Inc. announced that Sierra Wireless is leveraging a broad suite of Skyworks' 3G/4G connectivity solutions to power their AirPrime® HL Series wireless modules targeting machine-to-machine (M2M) and device-to-cloud applications. In total, Sierra Wireless is utilizing 17 Skyworks devices spanning high performance multimode, multiband power amplifiers, transmit/receive front-end modules, RF switches and DC-DC converters. Skyworks Solutions launched its newest SkyOne® front-end solution targeting the high growth China LTE market. The SkyOne Ultra 2.5 family includes both global and region-specific architectures that allow customers to use the same printed circuit board across multiple smartphone platforms designed for diverse end markets. Skyworks Solutions Inc. announced that Steven C. Machuga has been promoted to vice president of worldwide operations. Machuga has been with Skyworks since 1999 and most recently served as vice president of external manufacturing and operations engineering. Skyworks is pleased to introduce the SKY66105-11, a new high performance, highly integrated RF front-end module (FEM) designed for high power Industrial, Scientific and Medical (ISM) and Connected Home applications operating within the 902 to 931 MHz frequency band. This FCC-compliant module integrates harmonic filters and shielding, making it an ideal design choice for sensors, smart meters (water, gas, electric) and machine-to-machine uses. Skyworks Solutions Inc., an innovator of high performance analog semiconductors connecting people, places and things, introduced a suite of high performance amplifiers specifically addressing the rapidly growing small cell infrastructure market. Skyworks Solutions, Inc., an innovator of high performance analog semiconductors connecting people, places and things, launched SkyBlue™, a new and revolutionary enabling technology that enhances both the power capability and efficiency in LTE amplifiers and front-end solutions. Designs utilizing SkyBlue™ technology not only deliver twice the power of envelope and average power tracking systems available on the market today, but across much broader power ranges. Skyworks Solutions Inc. an innovator of high performance analog semiconductors connecting people, places and things, announced that TP-LINK's newest router OnHub is being enabled by semiconductor content from Skyworks. The product leverages more than 20 Skyworks solutions to power multiple radios and 13 fully integrated antennas across various standards including Bluetooth® 4.0, ZigBee®/Thread, 2 and 5 GHz applications for 802.11ac/b/g/n and Google's Weave. Skyworks Solutions, through its subsidiary Trans-Tech Inc., unveils webCRaFT, a new web-based ceramic bandpass filter selection program. Skyworks Solutions Inc., an innovator of high performance analog semiconductors connecting people, places and things,unveiled a family of ceramic-based filters targeting high frequency applications. Skyworks’ newest devices are compact, offer improved power handling and support frequencies up to 7 GHz. Skyworks Solutions Inc., an innovator of high performance analog semiconductors connecting people, places and things, introduced its next generation solutions for smart energy and industrial, scientific and medical markets. Skyworks Solutions Inc., an innovator of high performance analog semiconductors connecting people, places and things, announced that it is ramping front-end modules, wireless connectivity switches, power amplifiers, low noise amplifiers and power management solutions for streaming media and smart TV applications supporting OEMs such as Roku, Google, Amazon and Samsung. Skyworks Solutions, Inc. unveils an integrated, single-stage, low-cost PIN diode limiter module to address the growing need for full receiver low-noise amplifier protection in microwave applications. Skyworks Solutions Inc. introduced a 0.7 to 1.2 GHz, single-die cascode, GaAs, PHEMT LNA for cellular infrastructure applications such as tower-mounted amplifiers, remote radio units, repeaters and base stations. The LNA offers very low noise figure and high linearity along with excellent return loss and gain flatness. Skyworks Solutions Inc. introduces four linear power amplifiers for LTE and WCDMA applications. The fully matched surface mount SKY66001-11 (2110 to 2170 MHz), SKY66002-11 (1900 to 2025 MHz), SKY66005-11 (850 to 920 MHz) and SKY66008-11 (900 to 990 MHz) modules meet the stringent spectral linearity requirements of femtocell applications with high power-added efficiency. An integrated directional coupler eliminates the need for any external coupler. Skyworks introduces a low noise amplifier with high linearity and excellent return loss, while drawing as low as 5 mA of bias current. The internal active bias circuitry of the SKY67015-396LF LNA provides stable performance over temperature and process variation. Skyworks Solutions Inc., an innovator of high performance analog semiconductors enabling a broad range of end markets, announced that its highly integrated, low noise amplifier front-end modules are being leveraged by various OEMs to enable global positioning systems (GPS) and global navigation satellite systems (GNSS) in smartphones, tablets and other mobile devices in emerging markets. Skyworks Solutions Inc. announced that MediaTek is leveraging several of Skyworks’ front-end solutions in their innovative, dual-coreMT6572 platform which is supporting multiple leading tier-one smartphone manufacturers in emerging markets. Skyworks Solutions Inc., an innovator of high performance analog semiconductors enabling a broad range of end markets, unveiled a portfolio of low noise amplifiers (LNAs) that provide best-in-class noise figure, a critical component to boosting weak incoming signals for today’s 4G wireless infrastructure as well as diverse broad market systems including GPS, broadband, military and satellite communications. Skyworks Solutions Inc., an innovator of high performance analog semiconductors enabling a broad range of end markets, introduced groundbreaking RF switching technology that is enabling early adopters to implement carrier aggregation solutions. Carrier aggregation allows mobile service providers to combine spectrum and increase data rate throughput by utilizing two or more bands simultaneously instead of the single band method used currently, thereby giving consumers an enriched data experience regardless of location. Skyworks Solutions Inc. announced that its industry-leading silicon-on-insulator (SOI) switching technology is now being utilized by European, Japanese, Korean and North American car manufacturers for advanced infotainment systems. Specifically, Skyworks’ solid state technology is enabling seamless low noise and broadband switching between audio, Blu-ray/DVD, navigation, cell phone and vehicle security display inputs as well as a variety of other high bandwidth media sources in automobiles. Skyworks Solutions Inc. expanded its wireless portfolio with the introduction of highly integrated front-end modules enabling 802.11ac connectivity in smartphones and tablets. The company’s precision analog semiconductors are already being utilized in many of the world’s first commercially-available 802.11ac notebooks, ultrabooks, LED TVs, routers, USB data cards and Blu-Ray® players. Skyworks Solutions Inc., an innovator of high performance analog semiconductors enabling a broad range of end markets, is ramping several antenna tuning products with leading smartphone manufacturers. Skyworks’ devices are meeting the market demand for tunable antennas which dramatically improve performance by increasing data throughput, reducing dropped calls and minimizing the antenna footprint needed for today’s multiband LTE smartphones. Skyworks Solutions Inc., an innovator of high performance analog semiconductors enabling a broad range of end markets, announced that it has secured a reference design with Texas Instruments Inc. (TI) for smart energy, industrial and networking applications including electric/gas/water meters, street lighting, telematic and tracking systems. Skyworks introduces a highly efficient, broadband, 13 dB gain, GaAs HBT drive amplifier in a small 2 x 2 millimeter quad flat, no lead package. The SKY67130-396LF draws less than 23 mA at 3.3 V, while achieving +39 dBm OIP3, providing the market with a very compelling, high linearity solution. On-die active bias design ensures consistent performance and unconditional stability. Skyworks Solutions Inc., an innovator of high performance analog semiconductors enabling a broad range of end markets, introduced a family of highly efficient front-end solutions for smart water and gas metering applications. Skyworks’ front-end solutions enable significant size and cost reduction. In addition, many of Skyworks’ front-end solutions allow for plug-and-play functionality, drastically reducing the design time for new products. To date, Skyworks’ solutions are being utilized by 40 tier-one utility and smart energy providers throughout Europe. Skyworks Solutions Inc., an innovator of high performance analog semiconductors enabling a broad range of end markets, commenced volume shipments of several medium to high-power ZigBee® front-end solutions for smart meters, home automation, security sensors and gateway applications. Skyworks’ front-end solutions deliver the industry’s most integrated and highest efficiency devices, enabling leading broadband service providers, security companies and utilities to offer next generation connected home services with increased wireless ranges for applications including monitoring, control, energy management and health care. Skyworks introduces a 2.3 to 2.8 gigahertz, two stage, high linearity and high gain (32 dB) low noise amplifier that offers very low noise figure (0.85 db) and excellent return loss (15 db) in a small 4 mm square quad flat, no lead package. Skyworks Solutions Inc., an innovator of high reliability analog semiconductors enabling a broad range of end markets, introduced a line of high power RF switches – up to 100 Watts – supporting diverse market applications including TD-LTE infrastructure base stations, repeaters and low frequency military/microwave UHF and UVF radios. Skyworks Solutions Inc., an innovator of high reliability analog semiconductors enabling a broad range of end markets, today unveiled two new series of high performance and low power LNAs for multiple industrial, scientific, medical (ISM) bands and next generation cellular infrastructure applications. Skyworks’ newest low noise amplifiers enable enhanced wireless receiver sensitivity, wider dynamic range and a high level of design flexibility. Skyworks introduces a high power shunt PIN diode for transmit and receive switching applications. The SMP1304-085LF is a discrete solution in a very low thermal resistance package that combines very low insertion loss, good isolation, excellent power handling (40W C/W), and low distortion. Skyworks introduces three new miniature 0402 hyperabrupt varactor diodes for VCO, phase noise and voltage-tuned filter applications. These discrete, small form factor devices are offered in a low profile plastic surface mount technology package where low resistance, low-series inductance and a large capacitance ratio are required. Skyworks Solutions Inc. expanded its family of antenna switch modules (ASM) for smartphones and tablets, offering solutions in up to 14 throw counts to meet various handset manufacturers’ layout preferences and design needs. Skyworks is also unveiling a full suite of complementary discrete LTE transmit and receive solutions covering single pole double throw (SPDT) through single pole eight throw (SP8T) applications in a compact 2 x 2 millimeter footprint. Skyworks Solutions Inc. announced that several of its front-end solutions are being leveraged by the industry’s leading baseband providers for their smartphone platforms currently supporting all of the world's leading mobile broadband standards. Several of Skyworks’ newest power amplifiers and front-end modules deliver approximately 50 percent power added efficiency with a 30 percent smaller footprint. Skyworks Solutions Inc., an innovator of high reliability analog and mixed signal semiconductors enabling a broad range of end markets, announced that it is ramping global positioning system (GPS) and global navigation satellite system (GNSS) solutions for Samsung Electronics Co. Ltd., one of the world’s leading smart phone providers. The SKY1224x suite offers excellent low transmit/ receive insertion loss as well as high transmit to receive isolation, facilitating optimal system performance. Skyworks introduces our latest CATV solution, the ACA1240, a 1.2 GHz variable gain CCAP/edge QAM driver amplifier specifically designed for headend and remote PHY applications. The SKY13699-21 is a state-of-the-art CMOS, silicon-on-insulator double-pole, double-throw switch. The switch provides high-linearity performance, low insertion loss, and high isolation. The SKY68020-11 is a hybrid, multi-band multi-chip RFFE module supporting cellular LTE-M/NB-IoT (half-duplex system) transceiver platforms. The module integrates the entire RF front end. Skyworks is pleased to introduce its new high performance MIPI® antenna aperture tuner, the SKY5™9256-701LF. Our wideband 16-state solution is extremely compact and designed to deliver improved efficiency and enhanced bandwidth coverage ─ from 600 MHz to 6 GHz. Skyworks introduces its latest family of LTE broadband low-noise amplifiers (LNAs) targeting global cellular and M2M applications. These modules deliver low noise figure, excellent return loss and high-linearity performance along with high-gain and bypass modes. The SKY68001-31 is a hybrid, multi-band multi-chip RF front-end (RFFE) module supporting cellular LTE CatM1/CATNB1 (half-duplex system) transceiver platforms. The module integrates the entire RF front end necessary for an LTE multi-band radio operating in low-band B5/B8/B12/B13/B17/B18/B19/B20/B26 and mid-band B1/B2/B3/B4/B25/B39/B66 frequencies. Skyworks announced the launch of the SKY66113-11, the company's newest 2.4 GHz fully-integrated RF front-end module (FEM) supporting Bluetooth® Low Energy/Bluetooth® Smart, 802.15.4, Thread and ZigBee® applications. Skyworks is pleased to introduce the SKY65623-682LF, a low noise amplifier (LNA) designed for applications such as wearables, asset trackers, navigation devices, action cameras and more. Skyworks is pleased to introduce the SKY66105-11, a high performance, highly integrated RF front-end module (FEM) designed for high power Industrial, scientific and medical (ISM) and connected home applications operating within the 902 to 931 MHz frequency band. This FCC-compliant module integrates harmonic filters and shielding, making it an ideal design choice for sensors, smart meters (water, gas, electric) and machine-to-machine uses. Skyworks has released the SKY13592-689LF, a single-pole, double-throw switch for mode switching in WLAN applications such as ISM band radios, smartphones and connectivity modules. This 1 to 6 GHz device uses advanced switching technologies to maintain low insertion loss and high isolation for all switching paths. It also delivers high-linearity performance, making it an ideal choice for low-power transmit/receive applications. Skyworks has broadened its antenna tuner portfolio with two mobile industry processor interface (MIPI®)-controlled devices that support ultra-low Ron (SKY19247-686LF) and ultra-high Vpeak (SKY19237-001). These tuners are ideal for smartphones, data cards and MiFi® hotspots and improve antenna efficiency, as well as total radiated power (TRP) and total isotropic sensitivity (TIS) performance. Skyworks is pleased to introduce a family of GPIO-controlled, high performance RF cellular switches for LTE and GSM applications. The SKY13581-676LF (SP2T), SKY13582-676LF (SP3T) and SKY13626-685LF (SP4T) are for LTE, while the SKY13597-684LF (SP4T) is for GSM. This new family of switches is ideal for smartphones, data cards and MiFi® hotspot applications. Skyworks introduced two RF switches ideal for the Internet of Things applications including the connected home. The SKY13587-378LF, which is a pHEMT GaAs SPDT switch, can be used for transmit and receive switching in industrial, lighting and smart energy applications, as well as 802.11a/b/g/n WLAN networks. The SKY13588-460LF is a CMOS silicon-on-insulator SP3T switch made for antenna selection in Wi-Fi applications in IoT systems. Skyworks is pleased to offer solutions for a wide variety of automotive and transportation infrastructure systems. Skyworks’ portfolio includes AEC-Q101 qualified products ideal for infotainment, remote keyless entry, telematics / cellular, garage door opener, toll tag transponder, vehicle tracking, navigation, collision avoidance and radar applications. Skyworks' broad frequency range (10 MHz to 100 GHz) diodes cover switching, detector and mixer, tuning and phase shifter functions in small form factor packages. Skyworks is pleased to introduce two SPDT 75 Ohm switches that are ideal for set-top box and DVR applications. The SKY13547-490LF and SKY13548-385LF feature ultra-high linearity and meet the rigorous requirements of DOCSIS 3.0/3.1 applications. They also boast very low insertion loss and high power handling capability. Skyworks’ new switches are fully integrated and internally matched, reducing bill of material costs for customers. Skyworks Solutions Inc. unveiled SkyLiTE™ 2.0, its next generation front-end solution powering LTE devices. This highly integrated platform provides smartphone manufacturers with a complete front-end system that meets today’s carrier aggregation (CA) design challenges. The devices are baseband agnostic and incorporate amplification, switching, Wi-Fi filtering, and coupler functionality required to support all major FDD/TDD bands. Skyworks is pleased to introduce two broadband, 75 Ohm MMIC front-end, low-noise amplifiers (LNAs) designed specifically for set-top box applications: the SKY65450-92LF (with bypass mode) and the SKY65452-92LF. These devices provide high linearity and excellent gain over a wide frequency range (40 MHz to 1 GHz) with minimal external components, enabling OEMs to leverage cost efficiencies through lower bill of materials. Skyworks is pleased to introduce a dual-band single-pole four-throw (SP4T) WiFi switch with integrated GPIO interface and 50 Ohm match on all RF output ports. The SKY13575-639LF is ideal fordual-band switching in Wi-Fi access points, WLAN 802.11ac and 3G/4G LTE systems and is also suitable for access points, customer-premises equipment (CPE), LTE systems, dual-band WLAN and test and measurement equipment. Skyworks Solutions Inc. launched SkyOne® Ultra 2.0, a highly integrated, single LTE SKU solution that solves harmonically-related carrier aggregation challenges through design while delivering the highest linear RF power as well as power added efficiency in the world. This next generation platform is a complete RF front-end system consisting of three LTE modules which utilize Skyworks' revolutionary SkyBlue™ technology in addition to a separate 2G transmitter. Skyworks introduces the SKY81298 triple channel LED flash driver. The SKY81298 is optimized for LED flash applications implementing tri-tone flash LED color compensation, or dual rear LED flash, plus single front LED flash to support “selfie” pictures taken from the front-facing camera. The SKY81298 actively monitors battery/system voltage and reduces flash current automatically to avoid system brownout, allowing the flash to operate over a wider (lower) battery range. Skyworks introduces two high power, surface mount, series connected PIN diodes suitable for high-power, high-volume, large signal switch and attenuator applications ranging from 10 MHz to beyond 6 GHz. Typical resistance for the SMP1331-085LF and SMP1331-087LF is 0.50 Ω at 100 mA is and the maximum capacitance is 0.35 pF at 30 V. The low capacitance, low parasitic inductance devices are ideal for use in land mobile radios and infrastructure systems. Two Global Navigation LNA Front-End Modules: SKY65713-11 and SKY65715-81. Skyworks introduces two global navigation low-noise amplifier front-end modules with integrated filters: the SKY65713-11 and SKY65715-81. Both solutions support products integrating GNSS functionality such as smartphones, personal navigation devices, wearables, machine to machine (M2M) systems, base stations, asset tracking instruments, professional radios and Internet of Things applications. Skyworks introduces two global navigation low noise amplifiers. The SKY65605-21 and SKY65611-21 are both designed for BeiDou/GPS/GLONASS/Galileo receiver applications and are optimized to operate from 1559 to 1606 MHz. Each device integrates all output matching components, thereby requiring only a single external input matching component.The devices provide high linearity, excellent gain, a high 1 dB input compression point (IP1 dB), and a superior noise figure. Skyworks offers two low-power Bluetooth® low energy (BLE) front-end modules (FEMs) for connected home, wearable and industrial applications. The SKY66110-11 and SKY66111-11 FEMs operate between 2.4 to 2.485 GHz, with power consumption of only 10 mA in transmit mode. The FEMs more than double the range when compared to a standalone system on chip solution. The SKY66111-11 FEM features adjustable output power. Skyworks introduces an ultra-broadband low-noise amplifier (LNA) with superior gain flatness and exceptional linearity.The SKY67159-396LF single stage GaAs pHEMT LNA offers ultra-broadband performance with a single matching circuit, low noise figure and good linearity. On-die active bias design ensures consistent performance over process and temperature variation. The device allows high performance operation at temperatures up to +105 °C. Skyworks introduces a single-pole, double-throw (SPDT) switch that is qualified to the Automotive Electronics Council (AEC) Q100 standard. The SKYA2001 features low insertion loss (0.4 dB at 2.4 GHz) and positive voltage operation with very low DC power consumption (10 µA). Its AEC-Q100 qualification supports extended production life requirements. The device is manufactured in an ultraminiature 2.00 x 1.25 mm, 6-pin SC-70 package. Skyworks, through its Isolink subsidiary, introduces a low-loss, high performance wideband DC to 8 GHz hermetic GaAs IC single-pole, double-throw (SPDT) absorptive switch. The ISO13286 is ideal for high reliability space, satellite, and defense applications. The device performs with 50 dB isolation at 4 GHz and low loss of 1.5 dB at 4 GHz. Testing is available to the screening requirements of MIL-PRF-38535 Class B and S.
Skyworks, through its Isolink subsidiary, introduces a low-loss, high performance wideband DC to 6 GHz hermetic GaAs IC single-pole, single-throw (SPST) non-reflective switch. The ISO13316 is ideal for high reliability space, satellite, and defense applications. The device performs with 45 dB isolation at 2 GHz and low loss of 1.1 dB at 6 GHz. The ISO13316 die is produced with Skyworks' GaAs pHEMT process that has shown radiation tolerance to 100 kRad. Skyworks Solutions, through its subsidiary Trans-Tech, Inc., unveils webCRaFT, a Web-based ceramic bandpass filter selection program. Customers can easily search for bandpass filter solutions by defining target performance criteria. Frequencies range from 300 to 5000 MHz and bandwidths from 2 to 25 percent. Filters outside of those boundaries are available upon request. Skyworks introduces a series of voltage-controlled variable attenuators (VVAs) which are designed to have excellent third order input intercept point and superb dynamic range. The devices cover operation from 1.45 to 5.0 GHz, and have control voltages ranging from 0 to 5.0 V. The SKY12232-21, SKY12233-11, SKY12235-11 and SKY12236-11 are optimized for use as low distortion, analog attenuators – centered at 1.95, 2.60, 3.15, and 3.8 GHz. Skyworks introduces a step-up, three-channel LED driver with an I2C interface and pulse width modulation dimming control, offering 10-bit dimming accuracy down to 0%. The SKY82896 features a wide input voltage range of 2.5 to 5.5 V and high-boost switching frequency. Minimal external components reduce the solution size and make the device suitable for LED backlighting in single-cell, Li-Ion battery-based applications. Skyworks introduces eight low noise, variable gain receive modules for LTE and WCDMA infrastructure applications requiring low noise and high linearity. The SKY65369-11, SKY65370-11, SKY65371-11, SKY65372-11, SKY65373-11, SKY65374-11, SKY65375-11, and SKY65376-11, which are ideal for all wireless infrastructure OEMs and ODMs, are low noise, highly linear VGA modules that operate in the 700 to 2600 MHz range and feature very low return loss. Skyworks introduces a step-down, DC-DC converter for automotive, distributed power, industrial, and medical applications. The 28 V, 3 A, non-synchronous SKY87608-11-577LF is also applicable for general purpose, point-of-load, 16, 20, and 28 V voltage regulators. The converter offers prime thermal performance and space savings in addition to addressing the green-power initiative in the non-portable markets. Skyworks introduces a 0.5 to 4.0 GHz low-noise amplifier with an active bias, offering excellent return loss, low noise, and high linearity performance for applications including high performance wireless infrastructure, L and S band military radio, SDAR, DBS set-top box, and GPS. The SKY67103-396LF features internal active bias circuitry. The device also offers the ability to externally adjust supply current and gain. Skyworks Solutions Inc. introduces a hyperabrupt junction tuning varactor diode for automotive, consumer, defense and infrastructure markets. The SMV1275-079LF offers high capacitance ratio and low series resistance, ideal for low phase noise, UHF and VHF voltage-controlled oscillators, voltage-tuned phase shifters, tunable bandpass filters and microwave tuners. Skyworks Solutions Inc. unveils a single control, SOI, single-pole-double-throw switch. The compact, 0.01 to 6.0 GHz SKY13453-385LF is intended for mode switching in pre-power amplifier cellular and dual-band WLAN transmit/receive applications. It is a reflective short switch that offers high linearity, maintains low insertion loss and achieves high isolation for both switching paths. Skyworks Solutions Inc. unveils an integrated, single-stage, low-cost PIN diode limiter module to address the growing need for full receiver low-noise amplifier protection in microwave applications. The SKY16601-555LF is a low threshold/insertion loss/distortion module in a surface-mount package meant for use as a passive receiver protector in wireless or other RF systems for frequencies up to 6 GHz. Flip chip is a type of surface mountable packaging technology that reduces footprint and thickness (compared to conventional packaging), weighs less, is easy to assemble, lowers production costs and improves electrical and thermal performance. Their significant size and weight reduction makes them ideal for use in a variety of mobile devices. Skyworks Solutions Inc. introduces a highly integrated 5 GHz WLAN front-end module for reference designs targeting smartphones and tablets in a 2.5 x 2.5 mm, QFN package. The SKY85702-11 incorporates a power amplifier and a SPDT transmit and receive switch for mobile/portable 802.11ac applications and systems. Skyworks Solutions, Inc. introduces a 2110-2170 MHz single junction, robust lead isolator in an industry leading, small footprint, 11 x 11 mm surface mount package. The SKYFR-000727 is ideally suited for various wireless/cellular infrastructure applications including small-cell designs where space constraints exist. The isolator’s insertion loss is < 0.30 dB over an operating temperature range of –40° C to +100° C.
Skyworks Solutions, Inc. introduces a µSwitcher™ step-down converter for space-constrained, portable applications including Bluetooth® headsets, smartphones, digital cameras, hard-disk drives, portable media players and other battery-operated handheld computers/peripherals. The SKY87250 is a highly efficient, low-supply regulator with integrated inductor housed in a compact package. Skyworks Solutions, Inc. unveils a highly integrated, 5 GHz front-end module for wireless connectivity, Bluetooth® and mobile applications that exceeds 802.11n system requirements. The SKY65535-11 integrates a power amplifier, a low noise amplifier with bypass, and a single-pole-double-throw, transmit/receive switch in a 16-pin, 2.5 x 2.5 mm, quad-flat-no-lead package. Skyworks Solutions, Inc. unveils a new device for cellular infrastructure, VHF/UHF military and public safety radios. The SKY12408-321LF is a 50 to 600 MHz, 6 dB differential attenuator that is pin-for-pin compatible with its 12 dB SKY12407-321LF attenuator, but ideal for IF radio applications requiring lower overall attenuation and gain control. Skyworks Solutions, Inc. has introduced a miniature 0402 PIN diode for attenuator and transmit/receive switching applications. The SMP1302-040LF is a small form factor, low profile, discrete surface mount technology packaged solution that is ideal for the handset, WLAN, CATV/Satcom, land mobile radio and infrastructure markets. Skyworks Solutions Inc. has introduced a surface mount limiter diode for receiver protection applications. The CLA4608-085LF is a low capacitance silicon PIN limiter diode designed for high power applications ranging from 10 MHz to over 6 GHz. Maximum resistance at 10 mA is 1.2 Ω and maximum capacitance at 38 V is 0.65 pF. Skyworks Solutions Inc. introduced several new backlight LED drivers supporting next-generation smart phones and tablets. Skyworks’ family of highly efficient, integrated, multi-channel products are tailored to support display panels ranging in size from 4 to 12 inches, significantly enhancing image quality and resolution while maximizing battery life. Skyworks is pleased to unveil three high power SPDT switches for multiple applications. The SKY12207-478LF (0.9 to 4.0 GHz; 50 W), SKY12208-306LF (0.02 to 2.7 GHz; 50 W) and SKY12210-478LF (0.9 to 4.0 GHz; 100 W) deliver transmit/receive and failsafe switching functionality for TD-SCDMA and TD-LTE base stations, as well as land mobile radios and military communication systems. RFMW, Ltd. announces design and sales support for two new single-pole, multi-throw switches. The SKY13414-485LF is a SP4T and the SKY13418-485LF is a SP8T. Both parts cover a broad frequency range of 100 to 3000 MHz and are pin compatible with each other. The SP8T offers 0.65 dB typical insertion loss with >20 dB of isolation while the SP4T provides 0.55 dB insertion loss and >25 dB isolation. Skyworks has a new 0.02 – 4.0 gigahertz, gallium arsenide based high isolation, single-pole four-throw switch with integrated 50 Ohm terminations in small 3 x 3 millimeter quad flat no-lead plastic surface mount technology package. Skyworks introduces two new, enhancement mode, low noise amplifiers (LNAs) that offer low noise figure, high linearity, and excellent return loss while drawing very low bias current. The SKY67012-396LF (0.3 – 0.6 GHz) and SKY67013-396LF (0.6 – 1.5 GHz) LNAs are ideal for general purpose industrial, scientific, medical (ISM band), and other high frequency applications. The surface mountable, low capacitance silicon PIN limiter diodes are designed as shunt connected PIN diodes for high power limiter functions ranging from 10 MHz to over 6 GHz and are ideal for receiver protection applications.The diodes deliver low loss, very low series inductance, and low capacitance. Skyworks introduces three miniature 0402 varactor diodes for VCO, phase noise and voltage tuned filter applications. The SMV1247-040LF, SMV1248-040LF, and SMV1263-040LF provide small form factor, discrete solutions for a variety of phase and frequency control uses. These miniature, plastic surface mount technology (SMT) diodes have reduced footprints in industry-standard packages. The SMP1304-085LF is a high power shunt PIN diode for transmit and receive switching applications. 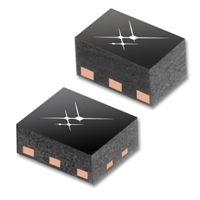 The SMP1304-085LF is a discrete solution in a very low thermal resistance package that combines very low insertion loss, good isolation, excellent power handling (40W C/W), and low distortion. The SKY67012-396LF, SKY67013-396LF, SKY67014-396LF, and SKY67015-396LFare ideal low noise amplifiers for battery powered receivers in applications including wireless metering and security, public safety radio, wireless microphones, and Bluetooth® headsets. The supply voltage is adjustable over a wide 1.8–5 V range and current draw as low as 5 mA. The SKY12207-478LF, SKY12208-306LF and SKY12210-478LF are high power SPDT silicon-based PIN diode switches. The 4 x 4 millimeter, 16-pin quad flat no lead packaged devices features low insertion loss, high isolation, excellent power handling (50 and 100 Watts) and superb linearity with low direct current (DC) power consumption. Skyworks introduces three miniature 0402 varactor diodes for VCO, phase noise and voltage tuned filter applications. The SMV1247-040LF, SMV1248-040LF and SMV1263-040LF provide small form factor, discrete solutions for a variety of phase and frequency control uses. Skyworks Solutions has introduced its first commercialized switch designed to provide simple switching between RF filters with differential inputs. The SKY13354-368LF is a dual-crossed SP2T solution that provides low-loss, higher-isolation, and fast-switching capabilities. Skyworks introduces three new surface mount limiter diodes for receiver protection applications. The surface mountable, low capacitance silicon PIN limiter diodes are designed as shunt connected PIN diodes for high power limiter functions ranging from 10 MHz to over 6 GHz. Skyworks Solutions has introduced three low-noise and high-linearity LNAs for 1.6 to 3.0 GHz receiver applications. The SKY67002-396LF, SKY67003-396LF and SKY67102-396LF are single-stage, GaAs pHEMT LNAs that offer ultra low noise figure, high linearity and excellent return loss in a small QFN package. Skyworks Solutions has introduced a high power series PIN diode for transmit and receive switching applications. The SMP1325-087LF is a discrete solution available in a high-thermal dissipative package – making it ideal for large signal switching and attenuation applications. Skyworks Solutions, Inc. has introduced a family of high power 50 Ohm terminated, single-pole, double throw switches. The small-package SKY13348-374LF and SKY13370-374LF are ideal for high power access points and router applications. Skyworks Solutions has introduced a new single stage GaAs PHEMT LNA that offers low noise figure (0.60 dB), very high linearity (23 dBm IIP3), and excellent return loss (14 dB) in a small 2 x 2 mm DFN package. On-die active bias design ensures consistent performance and enables unconditional stability. Skyworks Solutions, Inc. has introduced two small (1 x 1 mm packaged) GaAs single-pole, double-throw (SPDT) switches for WLAN applications. The SKY13366-378LF (2.0-6.0 GHz) and the SKY13350-385LF (0.8-6.0 GHz) switches target low power WLAN consumer premise device equipment. Skyworks launches surface mount limiter diodes for receiver protection in high power applications. Skyworks has introduced two double-poles, double-throw (DPDT) high-performance; cost-effective diversity switches in industry standard packaging and footprint. The SKY13355-374LF is a low-power variant and the SKY13381-374LF is a higher P1 dB version for higher linearity applications (in the same pinout). Skyworks launches miniature varactor diodes for VCO, phase noise and voltage tuned filter applications. Skyworks Solutions, Inc. has introduced two double-poles, double-throw diversity switches for 802.11a, b, g, n applications such as routers and access points. The SKY13352-337LF is ideal for high band applications, while the SKY13353-337LF is for low band. These new switches deliver antenna diversity and offer pin-for-pin compatibility, making them ideal for WLAN infrastructure providers. Skyworks is pleased to introduce a series of high gain, two stage LNAs employing both GaAs pHEMT and GaAs HBT technology that offer very low noise figure, high linearity and excellent return loss in a small, quad flat, 4 mm squared leadless package. On-die, active-bias design ensures consistent performance and enables unconditional stability. Skyworks Solutions, Inc. is pleased to introduce a high-power series PIN diode for large signal transmit and receive switching applications. This high thermal-dissipative diode combines low insertion loss, very good isolation, fast switching, excellent power handling and low distortion in a very small surface mount package. Skyworks Solutions Inc. introduces a miniature 0402 abrupt varactor diode for VCO, phase noise, frequency control and voltage tuned filter applications. This small form factor, low profile plastic surface mount technology (SMT) package is ideal for applications requiring low resistance and large capacitance over a narrow 0 to 30 V range in WLAN, CATV LNB, energy management, wireless infrastructure and military markets. Miniature 0402 varactor diodes from Skyworks. Skyworks Solutions, Inc. introduced the first in a series of ultra low current, general purpose low noise amplifiers (LNAs) for diverse wireless applications including satellite receiver set-top boxes, Bluetooth® headsets, medically-prescribed hearing aids, advanced meter reading devices and 2.4 GHz wireless local area networks. Skyworks is pleased to introduce a hyperabrupt varactor diode with a wide tuning range and low phase noise for VCO and voltage tuned filter applications. This general market diode targets WLAN, CATV LNB, energy management, wireless infrastructure and military applications. Skyworks & RFMW introduces select digital attenuators. With up to 7-bits and 0.25 dB step accuracy, these select digital attenuators operate up to 4 GHz for both RF and IF applications. All attenuators are absorptive in 50 ohm environments and easily cascadable – impedance matching is not needed between attenuators. Skyworks Unveils Next-Generation Ultra Low-Noise Amplifiers. High-Performance Solutions Meet Demanding Noise and Linearity Requirements for Multiple Wireless Infrastructure Applications. Skyworks Launches Mid- and High-Power WiFi Power Amplifiers. Solutions Ideally Suited for 802.11n Access Points, Routers and Gateways. Skyworks Solutions Inc. has introduced five 3 x 3 mm power amplifier modules (PAMs) with integrated daisy chain coupler for next-generation platforms. Skyworks Solutions, Inc. is pleased to introduce two new high-performance wireless local area network (WLAN) power amplifiers (PAs). A family of ultra-wideband fixed attenuator pads with a unique through-die via and split ground configuration that provide improved high frequency return loss, attenuation tolerance, flatness, and power handling performance. Skyworks launches industry’s widest frequency range integrated synthesizers for 3G/4G base stations. Solutions enable expanded capacity to support increasing mobile data traffic. Skyworks introduces the industry’s first suite of high performance broadband synthesizers spanning ultra wide frequency ranges from 375 MHz to 5.6 GHz. Three 4x5 mm dual band WCDMA power amplifier modules (PAMs) with an integrated coupler. Skyworks Solutions' metal-insulator-semiconductor (MIS) chip capacitors are available in a wide range of capacitance values and die sizes for chip-and-wire circuits requiring DC blocking, RF bypassing or as tuning elements in filters, oscillators and matching networks. Skyworks introduces two new varactor diodes for use in diverse applications such as mobile handset- based DTV receivers, FM tuners and low phase noise voltage-controlled oscillators. Skyworks Solutions, Inc. (NASDAQ: SWKS), an innovator of high performance analog and mixed signal semiconductors enabling mobile connectivity, today introduced the industry’s smallest and lowest profile packaged silicon radio frequency (RF) Schottky diodes in a 0201 surface mount technology (SMT) footprint. Skyworks’ new high performance, monolithic, digitally programmable low-pass filters – the SKY73201-364LF for single bands and SKY73202-364LF for dual bands -- are configured as 6th order Butterworth to provide extremely high stop-band isolation while maximizing pass-band flatness and minimizing group delay distortion. Skyworks Solutions, Inc. announces a 4 x 2 switch matrix combining a digital decoder with the RF switching network and tone/voltage detect designed for European- and Asian-market applications including Direct Broadcast Satellite (DBS) Low Noise Block (LNB) – the SKY13292-365LF. Skyworks has introduced a new family of general purpose gallium arsenide (GaAs) attenuators with excellent distortion performance for various types of linear applications including UMTS, WCDMA, WiMAX and WLAN. These GaAs digital single-positive-control step attenuators are also designed for base station transmitter and receivers, and can be used in radio frequency identification (RFID) transceivers. Models SKY77517 and SKY77518 are ultra-compact, dual-band transmit GSM/GPRS front-end modules designed for handsets targeted at emerging markets. Designed in low profile, compact form factor, these highly efficient 6 × 8 × 1.2 mm models offer a complete transmit VCO-to-antenna and antenna-to-receive SAW filter solution. View Skyworks’ New and Featured Products brochure, featuring full specifications for all new products, and highlighted solutions by market. For your convenience, part numbers within the brochure PDF link directly to product information on Skyworks' Web site. View Skyworks’ New and Featured Products brochure for spring 2015, featuring full specifications for all new products, and highlighted solutions by market. For your convenience, part numbers within the brochure PDF link directly to product information on Skyworks' Web site. Skyworks’ family of DRx modules incorporate low loss RF switches, receive SAW filters and LNAs, leveraging the company’s systems level expertise to deliver highly integrated solutions that dramatically enhance downlink data rates in LTE advanced MIMO systems. By amplifying the receive signal, receiver sensitivity and data throughput are improved. As a result, carriers benefit from improved network efficiency and consumers enjoy a more robust data experience. SkyOne® Ultra, the newest addition to the SkyOne® platform, leverages Skyworks’ broad systems expertise resulting in a highly configurable, integrated solution that is optimized for envelope tracking, solves harmonically-related carrier aggregation challenges and delivers the highest power added efficiency in the world. SkyOne® Mini, a derivative of the SkyOne® platform, specifically addresses the growing demand for value-oriented solutions in the LTE market by delivering the full functionality associated with the highly integrated SkyOne® devices but at a reduced cost and size. Skyworks' Product Selection Guide offers specifications and block diagrams representing our broad product portfolio for diverse applications. New products are listed in blue/bold. For your convenience, part numbers within the Guide PDF link directly to product information on Skyworks' Web site. View Skyworks’ New Products brochure for winter 2014, featuring full specifications for all new products, and highlighted solutions by market. For your convenience, part numbers within the brochure PDF link directly to product information on Skyworks' Web site. View Skyworks’ June 2014 New Products brochure, featuring full specifications for all new products, and highlighted solutions by market. For your convenience, part numbers within the brochure PDF link directly to product information on Skyworks' Web site. Skyworks’ broad product portfolio includes high-efficiency, pulse width modulation (PWM) switch-mode voltage regulators ideal for a wide variety of applications such as smartphones, portable navigation devices (PNDs), notebook computers, set-top boxes, digital still cameras, and other portable electronic devices. Step-up and step-down converter solutions are available for a range of output power, optimized in both size and performance for specific power levels. Want to learn about the performance and characteristics of two new breakthrough, ultra low noise LNAs with best-in-class noise figure? Topics include techniques used in biasing and matching. A circuit description with information on thermal considerations is also addressed. Skyworks’ SKY67150-396LF and SKY67153-396LF are designed to cover a wide bandwidth, using two devices with design and performance analyzed from 30 MHz – 4.0 GHz. The package pin-outs for each device are identical, with different application schematics and frequency bands. Read on! The Right Design Choice Starts Here! We invite you to review our new product offering from our broad portfolio for key markets and applications, including product specifications. Skyworks is committed to supporting designers with leading edge performance products for designs targeted at <170, 410-470, 868-930, and 2400-2500 MHz radios. These solutions are ideal for applications ranging from wireless local area networks (WLAN), automated metering infrastructure (AMI), automated meter reading (AMR), professional mobile radio (PMR), and other ISM band applications. Our portfolio includes front-end modules (FEMs), power amplifiers (PAs) and drivers, low noise amplifiers (LNAs), switches; phase lock loops (PLLs), voltage control oscillators (VCOs), synthesizers, diodes, and power management products. Additional applications include ZigBee® (IEEE 802.15.4), industrial and control unlicensed band radios, plug-in hybrid electric vehicles (PHEVs), 802.15.4g, and home security and automation. Isolink (a subsidiary of Skyworks Solutions, Inc.) is the leading supplier of high performance and high quality optoelectronic radiation tolerant components worldwide. Founded by veterans in the optoelectronics industry, Isolink is headquartered in Milpitas, California. Isolink’s mission is to provide products and services to the high-reliability, military, aerospace, hybrid, industrial, medical, and telecommunications markets. Isolink specializes in the manufacture of high-performance miniature hybrids and hermetically sealed devices. The company pioneered the miniaturization of some of the most advanced optoelectronic components. Our expertise in optoelectronic components enables us to make products of high quality, achieving high isolation voltages. A hallmark of Isolink’s products is high common mode rejection and radiation tolerance for high demand environments. Skyworks Solutions, through Trans-Tech, its industry-leading ceramic products division, designs and manufactures a complete line of RF and microwave components for commercial markets. With over 50 years of experience, we offer a complete line of high quality, low-cost, ceramic-based components for a number of RF and microwave markets including wireless communications, infrastructure, military, cable television, broadband access, circuit miniaturization, technical powder, and ingots. Our tightly controlled processes, from raw materials to forming, firing, finishing, assembly and test, produce the highest quality and the most consistently reproducible components available today for both low and high volume requirements. Our product portfolio includes dielectric resonators and coaxial transmission line elements for DRO and VCO applications, ceramic bandpass filters, ferrite, and garnet material for circulators/isolators. With over 50 years of advanced ceramic expertise, Skyworks Solutions, through its Trans-Tech advanced materials product line, is the industry leader in technical ceramic materials. With our in-house manufacturing capability, we can deliver materials that range from custom particle size distributions for thermal barrier coatings and fuel cells, to machined precision components. Because we are an independent material supplier, our customers can rest assured that their proprietary material compositions will be kept confidential. Skyworks’ family of broadband, high power handling, high linearity, single-pole single-throw (SPST) and single-pole double-throw (SPDT) transmit and receive (T/R) switches deliver low insertion loss and high isolation and are ideal for use in up to 150 W RF input power applications. Skyworks’ power, lighting, and display product portfolio includes industry-leading, light emitting diode (LED) camera flash driver solutions which enable longer battery life and deliver enhanced picture quality for smartphones, tablets, cameras, and other portable devices. System level simulations are not easy. Adding individual integrated or discrete componentâs foundry/supplier kits to the system simulation adds complexity. Through Skyworksâ BlackBox model for the low noise figure SKY67151-396LF LNA, which does not include any extra modeling kits, customers can accurately simulate and predict small and large signal performance. Skyworks offers RF microwave products for defense and homeland security systems, including radio communications, radars, electronic surveillance, electronic countermeasures, and more. In addition to our standard consumer off-the-shelf (COTS) product offering, diode product screenings equivalent to up to JANS level of MIL-PRF-19500 and Class K of MIL-PRF-38534 are available. Skyworks offers a broad portfolio of RF / microwave products, including components and subsystems, for CATV / DBS and TV / FTTH systems for video distribution and two-way communications. We invite you to review the newest product offering for CATV / Satcom applications, including block diagrams and product specifications. Skyworks is committed to operating under business practices that “meet the needs of the present without compromising the ability of future generations to meet their own needs.” Our efforts include policies and programs that encompass a variety of elements including environmental to labor, health and safety, ethics, stewardship, and management systems. WiFi and Bluetooth® connectivity solutions for mobile devices, computing, networking and home entertainment applications. Our 2.4 GHz, 5 GHz, and dual-band products cover WLAN 802.11a,b,g,n, and high throughput 802.11ac standards. The broad portfolio supports a wide range of end products from access point and routers to mobile/portable subscriber equipment. Skyworks is an innovator of high performance analog semiconductors. Leveraging core technologies, Skyworks supports automotive, broadband, cellular infrastructure, energy management, GPS, industrial, medical, military, wireless networking, smartphone and tablet applications. Headquartered in Woburn, Mass., Skyworks is worldwide with engineering, manufacturing, sales, and service facilities throughout Asia, Europe and North America. Diodes are used in a variety of designs, such as power detector, and ESD protection circuits. It is highly desirable to have good diode model that can accurately predict bias-dependent Sparameters and harmonics. Standard models fail to predict accurate CV dependence and cannot give the right impedance and nonlinearity. Scaling rules with unknown coefficients are assumed for each model parameter, which correlated model parameters among different devices. Scalable model can thus be extracted by a multi-device optimization. It is demonstrated with the optimization on nine devices that our approach yields accurate scaling rules for each parameter and very good fitting for each device. The critical parameters in a plasma process include temperature, gas flow, gas chemistries, pressure, and effective power. Each of these parameters modifies the etching or deposition-process characteristics. This paper demonstrates that overall process uniformity can be enhanced by metalizing the backside of the wafer. During the MBE growth process of a pHEMT structure, the growth of buffer layer and superlattice generally take more than 70% of the overall resources and time. Here we focus on the reduction of the MBE growth time by optimizing the buffer and superlattice structures, and discusses the challenges associated with thinning these layers. The HBT ledge thickness and quality is vital for device performance and reliability. In this work we report on a measurement technique and test structure for monitoring the emitter passivation ledge based on the use of TaN as a barrier between the InGaP ledge surface and the top metal contact. High data rate wireless local area networks (LAN) have fueled the rapid growth of portable electronics. To keep the overall solution cost of portable devices low, the wireless transceiver should be highly integrated with the baseband as a system-on-chip (SoC) solution, preferably using a low-complexity CMOS process. High-performance communications systems utilize digital baseband signal processing, where very little of the signal processing is performed in the analog/RF domain. Such signal processing includes filtering, phase/frequency de-rotation, channel equalization, pulse shaping, and modulation/demodulation. When sampling rates and numeric precision are accounted for, digital signal processing provides ideal functionality. Amplifiers used in wireless infrastructure receiver applications have the key requirements of low noise, high linearity, and unconditional stability. In order to meet these needs, Skyworks has developed a new family of low noise amplifiers (LNAs) implemented in 0.5 μm enhancement mode (E-Mode) pHEMT. Modern smartphones and tablet computers typically incorporate multiple wireless services at different frequency bands ranging from FM radio to LTE. At the same time, an increasing number of designs utilize more than one antenna to enhance sensitivity and suppress cross-talk. The term fractional-N describes a family of synthesizers that allow the minimum frequency step to be a fraction of the reference frequency. Over the years, a number of methods have been proposed to realize fractional-N frequency synthesis that are based on the basic concepts of traditional integer-N synthesis.